My Tasks – your tasks to the next level. You asked, we listened! 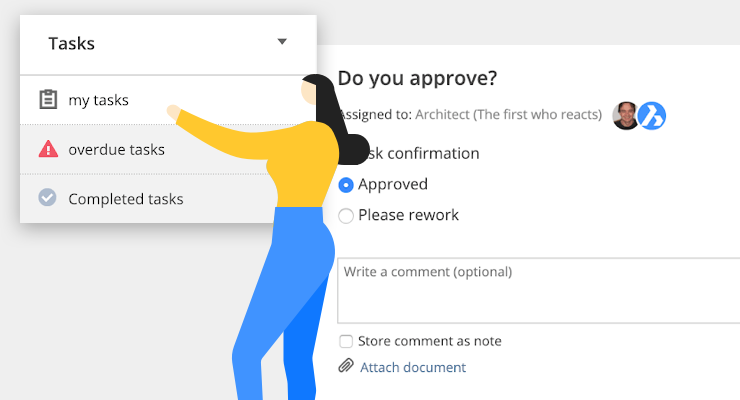 All of your comments were brought together to improve our interface in a way that works best for you. Bricsys 24/7 now makes it easier to review and execute the tasks you’re assigned to with My Tasks. My Tasks is found, just like all the other apps, in the bar to your left. The My Tasks app icon will display a small, red box with a number indicating the number of open tasks you currently have. For each of the sections, a list of documents and the task name appears on the left-hand side. The first task gets selected automatically and displays the task in detail to the right. The document information is displayed below. Click on the document name to view the details or click the preview to open it in our online viewer. 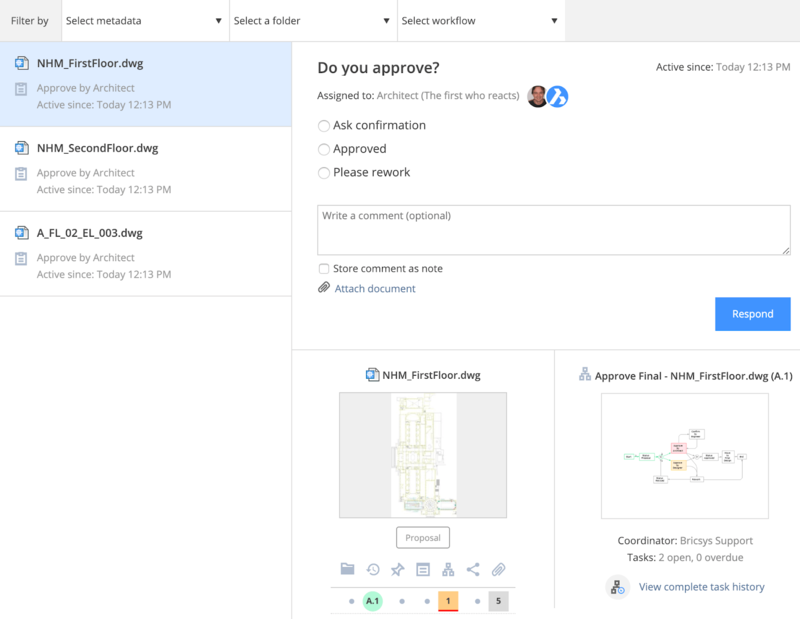 For those who wish to see the status of the workflow, simply click on the preview to see a visual representation of the current status of the workflow or to simply view the completed task history. Do you have too many open tasks and need to focus on a specific set of documents first? 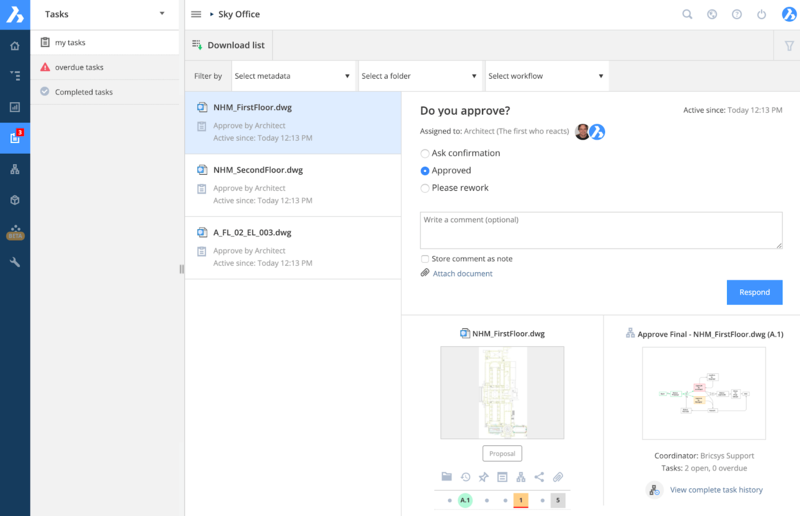 It’s possible to filter your tasks by metadata, folder, and even workflow. On the top panel of the app, you’ll find the filter options. Find out more about Bricsys 24/7 at www.bricsys.com. Easy to try, easy to buy, easy to own. That’s Bricsys. Try all of our products, for free for 30 days. Freedom of choice. You’ll love what we’ve built for you with the Bricsys product family. Rose is Bricsys' English Content Creator. 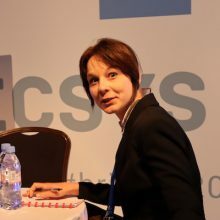 She has worked in the Automotive, Aerospace and Defense industries as a Technical Illustrator, before coming to BricsCAD. She loves cars, vectors and 3D printing.